What is the difference between K-13 and SonaSpray “fc”? K-13 works both as a thermal insulation and acoustic finish. K-13 is sprayed between one and ten inches thick. SonaSpray “fc” has a more refined texture than K-13 and is purely used as an acoustical finish for sound control. SonaSpray “fc” is typically sprayed at ½”, with a maximum thickness of 1”. Both K-13 and SonaSpray “fc” are available in custom colors. What is the difference between SonaSpray and SonaSpray “fc”? Nothing. SonaSpray and SonaSpray “fc” are often confused as two separate products, however, they are one and the same. SonaSpray “fc” was developed when ICC recognized the need for a more refined acoustical finish in certain projects. 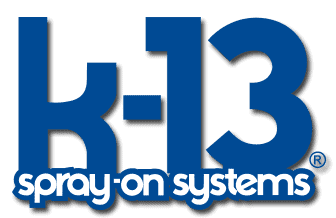 The new product was initially named K-13 “fc” for “finished ceiling.” Later, it was renamed SonaSpray “fc” to avoid confusion between K-13 and the new product. Which is better for our application, K-13 or SonaSpray “fc”? The perfect solution for your unique project depends on the aesthetic you are trying to achieve, in addition to the thermal and sound absorption requirements. For a project with thermal requirements, K-13 is the correct product for you as SonaSpray “fc” is purely used for acoustical benefits. If your project requires a more refined finish, however, SonaSpray “fc” may be the better choice. Please contact us so we can work with you to find which product fits your project. Can K-13 or SonaSpray “fc” be applied by any Insulation/Acoustical Contractor? No. These systems require specialized application equipment and a high degree of application skill. In order to maintain the high standard International Cellulose Corporation sets for their products, K-13 and SonaSpray “fc” are only installed by factory-licensed installers who have completed the necessary training. Do colors add to the cost? Yes. All of ICC’s products come in standard and custom colors, however the price does increase when specifying custom-matched colors. Can K-13 or SonaSpray “fc” be painted? Yes, BUT, please consult International Cellulose Corporation for the correct practices or the benefits of our products can be compromised. How can I determine the correct thickness and product to specify for my unique space? Please contact us so that we can help you to determine the correct product and thickness for your project based on your unique aesthetic, thermal, and sound absorption objectives. How long will K-13 or SonaSpray “fc” last? ICC products can provide decades of performance. The George R. Brown Convention Center, built in 1987, has the original application of K-13 throughout the convention center. Does K-13 and /or SonaSpray “fc” comply with building codes? Yes. Both K-13 and SonaSpray “fc” are compliant with building codes. For a complete list of codes and approvals, please refer to the Approvals and Ratings on page 4 of our Brochure. Can K-13 be used in a gymnasium where basketballs and volleyballs may strike the surface? Yes. ICC products provide a strong resilient bond and can withstand incidental impact. How long does it take to treat a gymnasium with your system? Typically four to five working days. Installations are usually sprayed during the vacation times when the area can be completely closed off until the work is done. How long must we wait before we can use our gym? You can use your gym as soon as the work is completed. However, the spray does not reach its highest compression and bond strength until it is fully cured. Curing time can vary depending on thickness of application and degree of ventilation. During curing time, do not allow traffic on the rooftop and take care to prevent balls from hitting the ceiling. Can K-13 or SonaSpray “fc” be used in high humidity areas like an indoor pool? Yes. With the proper air exchanges present, K-13 or SonaSpray “fc” can be the perfect solution to thermal and acoustical problems often present in natatoriums. Please refer to the projects page for examples of indoor pools treated with K-13 and SonaSpray “fc”. Are there any installations in our geographic area that we may visit and/or call for a reference? Yes. Our products have been around for over fifty years and with that comes a long list of projects we have been involved in. Though some areas may not be open to the public, we are confident we can find an example of our work for you to see in person. How much would it cost to spray our project? The cost of installation depends on many factors. The size of job, specified thickness, color, degree of difficulty, scheduling time, prevailing labor rates, and geographic location are all factors that go into the bid cost. Budgetary estimates are available from any of our licensed installers or by contacting us directly. For answers to any other questions, please Contact Us.